Open all year, The Blackcock Inn Caravan Park & Campsite is a small and friendly, family run holiday park found close to Exmoor National Park, offering exceptional access to the whole of Devon. This site was previously known as Yeo Valley Holiday Park, but is now under new ownership. Guests are welcome to pitch here in their caravans, motorhomes and tents, while there are also a small number of chalets and holiday homes for hire, plus bed and breakfast accommodation is available at the country pub opposite this campsite. In addition, if you’d like to extend your stay, seasonal pitches are offered at this site. Most of the pitches at The Blackcock Inn Caravan Park & Campsite have electric hook-ups, plus some water hook-ups are available. In total, there are 65 pitches, of which 60 have electric hook-ups and 30 are hardstanding. Searching for a holiday caravan in Devon to rent? There are five at this campsite, which you can hire between March and November. They each have two bedrooms and can sleep up to six people, the lounge area converted into a bedroom if needed. The holiday caravans have well equipped kitchens, with a fridge/freezer, toaster, microwave, kettle and so on, plus a toilet, a basin and a shower in the bathroom. Please bring your own towels, but bed linen will be provided. There are also two holiday cottages, which you can hire any month of the year. One cottage sleeps six, the other sleeps four and, again, bed linen is provided. These self contained cottages have all you need for your holidays in Devon, with kitchens and bathrooms, and they share an enclosed courtyard. The Blackcock Inn Caravan Park & Campsite is a family friendly and dog friendly campsite that welcomes rallies. Facilities here include an amenities block, a laundry, an area to do your washing up, a heated, indoor swimming pool, a games room, a children’s play area, an on site pub with takeaway food (the campsite’s name gives you a clue in this regard!) and a shop. Wi-Fi is available, too. And if you like live music, you’re in luck, as there are regular gigs at the on site pub. 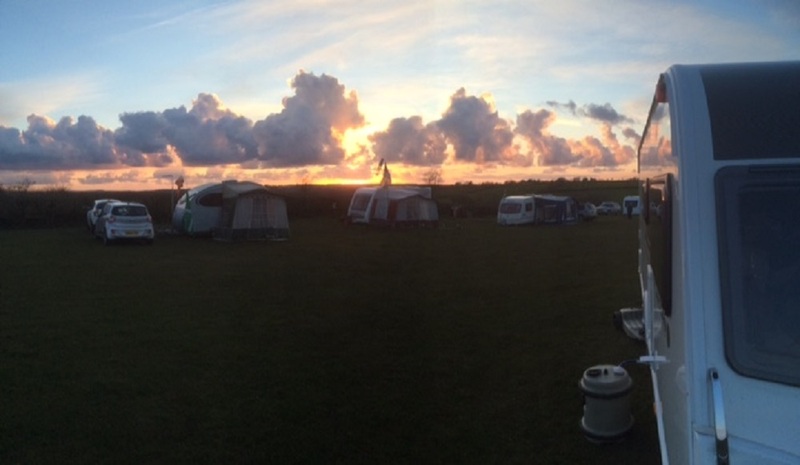 This campsite is in a super location from which to explore the county during your camping, motorhome and caravan holidays in Devon. It’s just a short drive off the A361, which makes it easy to get to and easy to get from, if you want to get out and about. Stay here and you’re just a few miles south of the Exmoor National Park, a stunning, beautiful area, that runs right up to the Exmoor Heritage Coast on the north Somerset coastline. Discover Exmoor on foot, or go cycling or horse riding. You can also go climbing or canoeing, or enjoy fishing or stargazing. Barnstaple is just a 25-minute drive away, while the pretty seaside resort of Ilfracombe is about 50 minutes from The Blackcock Inn Caravan Park & Campsite. You can also take time to savour the North Devon Heritage Coast, and visit Woolacombe and Croyde (both just under an hour from this site by car) to enjoy the region’s sandy beaches.